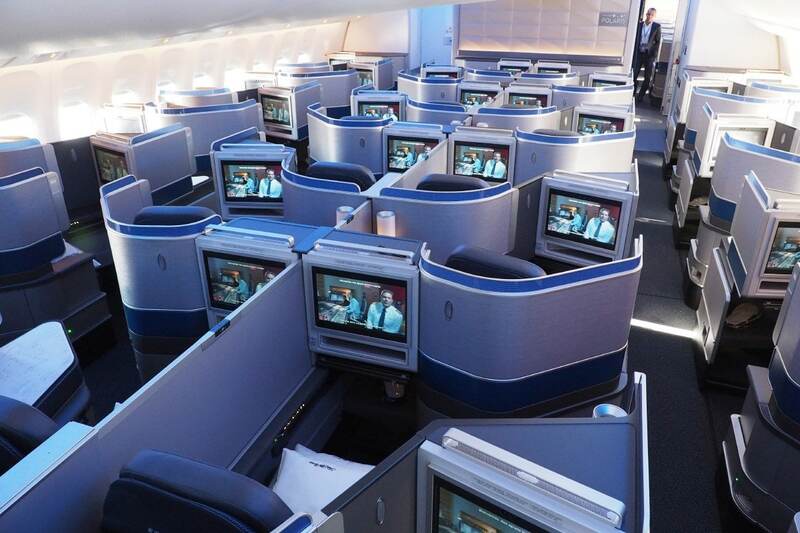 From 16 April, premium cabin Star Alliance awards will increase from 6-12%. Book your awards now to lock in existing prices. The Star Alliance award chart was untouched, but it seems that SQ has now decided to increase the cost of Star Alliance award redemptions effective 16 April 2019. How much have Star Alliance award prices increased? 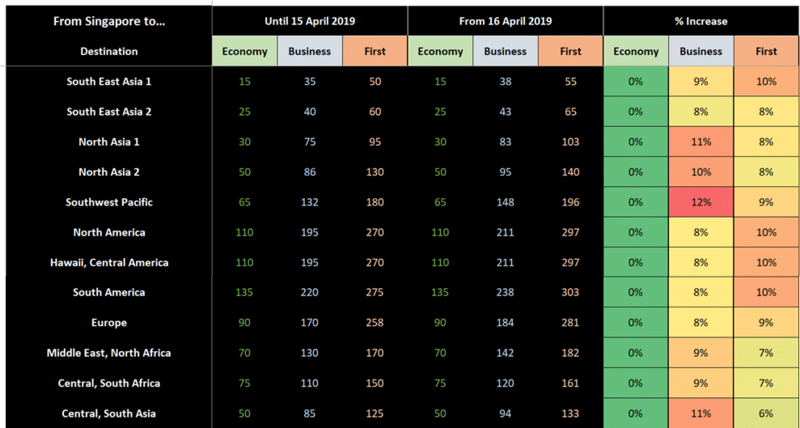 The table below compares the old Star Alliance award prices (round trip) to the new ones which take effect from 16 April 2019. Round-trip prices shown. You can book one-way awards for 50% of the miles. You can see that Economy Class award prices are unchanged. Business Class prices have increased from 8-12%, and First Class prices have increased from 6-10%. These increases are roughly in line with the SQ/MI award chart devaluation we saw in January. How do Star Alliance awards now compare to Singapore Airlines awards? The January 2019 devaluation left the Star Alliance award chart untouched, which created the strange situation where you could fly to certain destinations for fewer miles by simply tacking on a Star Alliance flight to the end of your itinerary. For example, it would cost 92K miles to redeem a one-way SQ Business Class award from SIN-FRA, but only 85K miles to redeem a one-way Star Alliance Business Class from SIN-FRA-TXL. In theory, passengers could fly the SIN-FRA leg on SQ, then skip the FRA-TXL leg if they didn’t have any check in luggage. 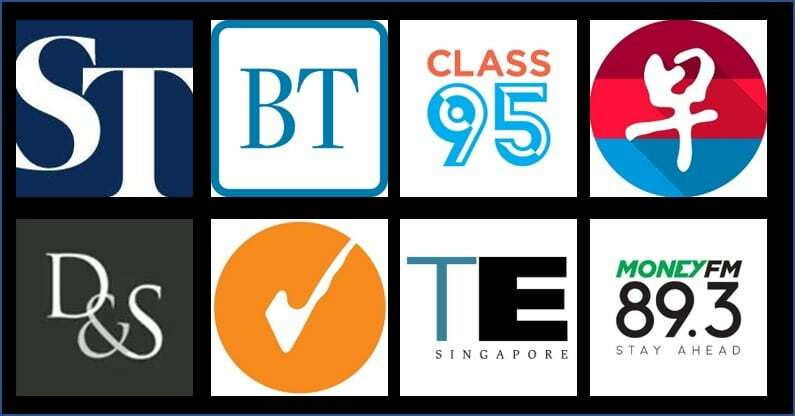 That’s not going to be possible any longer from 16 April 2019 as SQ has harmonized the Star Alliance award chart with the Singapore Airlines/SilkAir one. Now, a Star Alliance award always costs the same or more than its equivalent Singapore Airlines/SilkAir counterpart. Here’s how Singapore Airlines/SilkAir saver prices now compare with Star Alliance award costs (I’ve used one-way prices this time to facilitate comparison). When you take into account the fact that Singapore Airlines does not impose fuel surcharges on SQ/MI awards but does on partner awards, it’s hard to make the case for redeeming a Star Alliance award should there be SQ Saver space available. 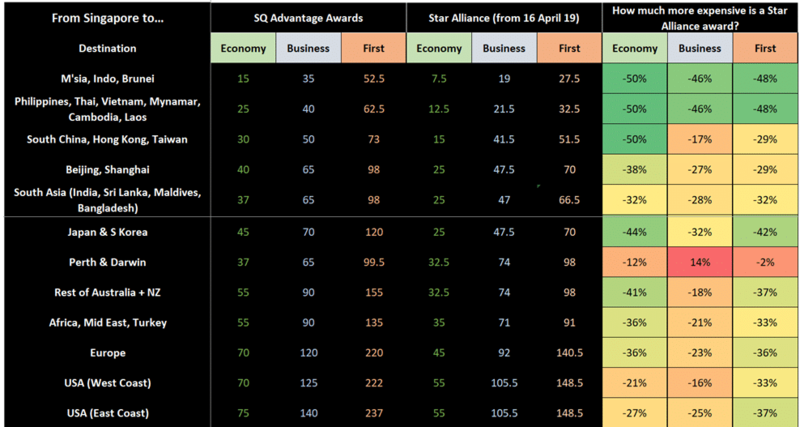 However, when SQ Saver space is not available, the Star Alliance award chart still offers better value than redeeming an SQ Advantage award. The existing Star Alliance award chart is valid until 16 April 2019, so you have just over 3 weeks to lock in existing prices. You can book awards up to a year in advance, although not all partner airlines may release award space that early. If you subsequently need to change your flight dates, you can do so for US$50 per change while keeping your existing award price. However, if you need to do a re-issuance of the ticket, you’ll have to pay the difference in miles. Re-issuance situations include a change of route, flight or partner carrier. Star Alliance award flights can be booked through the Singapore Airlines website, although not all airlines are available (eg Asiana, Air India, domestic flights in Japan and New Zealand). You might want to try searching through alternative platforms like Aeroplan or ANA. Once the SQ/MI award chart was devalued, it was only a matter of time before Singapore Airlines dropped the other shoe on the Star Alliance chart too. If you’re planning to travel in the upcoming year (especially if you’re flying point to point outside of Singapore, or to a destination not served by SQ from SIN), take a good look at the Star Alliance award chart changes and decide if you need to lock in anything in the upcoming weeks. Guess these devaluation makes the miles games less attractive. Would it be better if the charts are in other colours rather than black?